Getting content available to customers is easy with advice on how to sell self-published books on Amazon, and it's provided by Digital Marketing Labs. ...the website makes reaching interested audiences a breeze with a multitude of programs and opportunities. A Special Report from the Digital Marketing Labs is helping writers learn how to sell self-published books on Amazon, since the website makes reaching interested audiences a breeze with a multitude of programs and opportunities. A recent article from the business marketing advisors highlighted the report, and discussed its many helpful tips. The Digital Marketing Labs have poured hours of data and analysis into “Partnering with Amazon: How to Give Amazon Permission to Sell Your Products to their over 275 Million Registered Buyers.” The report covers self-publishing procedures as well as product selling and the Amazon Advantage Program, said the article. The two most common styles of getting content to the masses on Amazon are Kindle Direct Publishing (KDP) and CreateSpace. CreateSpace is essentially a print-on-demand service for books, music, DVDs, and other digital content. KDP, on the other hand, is Amazon’s own publishing site for e-book materials that are made available in several different e-reader formats, including tablets, smart phones, computers, PDAs, and of course, Kindles. The article mentioned both as potential landing spots for creative content. One of the newer developments in the Amazon publishing world is Kindle Singles, which are shorter pieces, essays, journalistic reports, and the like, and are usually written by an experienced author. With KDP, Amazon can and will do the majority of the work. Most of all, if content gets published through KDP, its Internet traffic-generating potential will be strengthened, its search engine ranking stands to be increased, and its back will be covered by Amazon, the e-commerce king, according to the article. The Digital Marketing Labs help entrepreneurs with innovative marketing techniques that are meant to be workable, winning strategies. 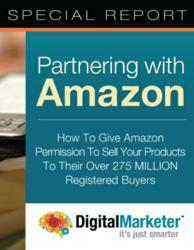 The article recommends getting started finding out how to sell self-published books on Amazon by getting a copy of “Partnering with Amazon” at http://digitalmarketer.com/reports/partnering-with-amazon/.